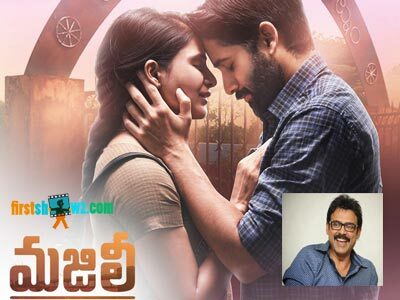 Here's the latest buzz making rounds in the Tollywood that Victory Venkatesh is going to be the chief guest of Majili pre-release event to be held on 30th March. Venkatesh seems to have taken up the job of supporting Akkineni Star couple Samantha and Naga Chaitanya, who are the lead actors in Majili movie. Majili is a romantic entertainer gearing up for grand release on 5th April, and the team is busy with the promotional activities. This Shiva Nirvana's directorial also features Divyanshika Kaushik as other female lead. Produced by Sahu Garapati, Harish Peddi, Sushil Choudhary under the banner Of Shine Screens, Majili has music compositions by Gopi Sundar. This is Naga Chaitanya and Samantha's first movie post-wedding, and they will be seen playing husband and wife. It is worth mentioning that Venkatesh and Naga Chaitanya are sharing screen together for a multistarrer Venky Mama which features Raashi Khanna and Payal Rajput as the female leads.